Moving on up to the next level. This second course of Harriet Hargrave's quilting treasures will inspire and challenge you to start designing your own quilts. Drafting exercises help you learn to make any quilt, any size, with or without a pattern. Loads of tips, techniques, and helpful charts. Get a college-level education in quiltmaking from the comfort of your own home. The Sophomore Year will take you from the basics to complete mastery with easy-to-follow lessons and hands-on exercises. 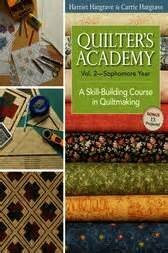 Requirements: Quilter's Academy 2 Book. Sewing machine and general sewing supplies in good working order, colored pencils, graph paper. Must have completed Freshman Year.